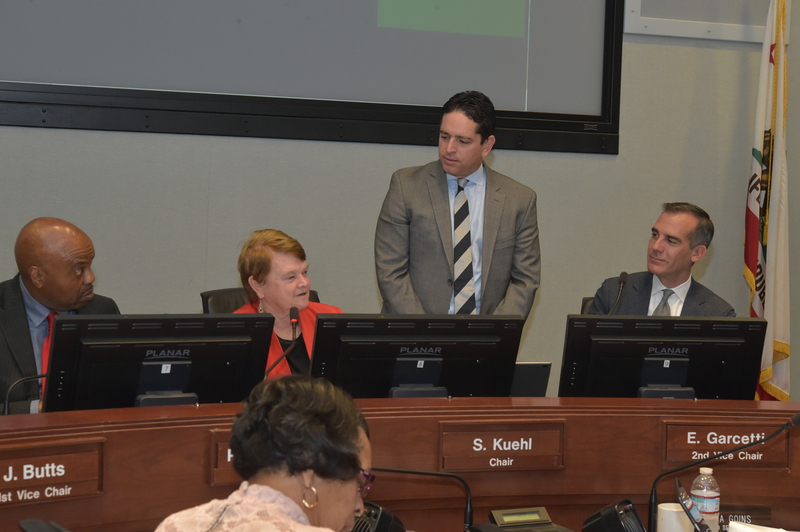 Borja Leon — the guy usually behind the scenes — accepting some kudos from Board Chair Sheila Kuehl and L.A. Mayor Eric Garcetti at last week’s Metro Board meeting. Borja Leon started working in City Hall the same time that I did in 2005. He was working as Deputy Mayor of transportation for Mayor Antonio Villaraigosa and I was helping cover City Hall for the L.A. Times. I’ve known Borja since then as his continued as Chief Transportation Deputy when Mayor Eric Garcetti took office in 2013. Borja announced that he was leaving City Hall a few weeks ago and given his vantage point for the past 13 years, I thought it would be interesting to lob a few questions at him. From a mobility point of view, what was the L.A. area like when you started in ’05 compared to what it’s like in late ’18? When I started working in City Hall for Mayor Antonio Villaraigosa back in 2005, downtown was a ghost town after 5 p.m. Other parts of Los Angeles were similar. This is because significant housing and infrastructure development at that time was almost non-existent. Most people opted to commute by car to work and only a limited number of transit connections were available. Things have changed dramatically since then. Soon after the financial and recession crisis, an incredible amount of infrastructure and development investments began taking place. One game changer was when we passed Measure R in 2008, which was the first significant transportation down payment in the last 20 years and a key factor to help Los Angeles weather the recession. Both housing and transportation investments began taking place — and I don’t think it was a coincidence. We had mayors who were interested in urban revivals and transportation. Areas such as downtown, the Westside and communities in the Valleys and East Los Angeles began to flourish. People began moving from the suburbs to higher density areas. While this was happening, many opted to try new transit lines such as the Exposition Line and Foothill Gold Lines to get to work. These folks realized that these new transportation alternatives were good and they were also willing to pay for it. And in the last few years, I would also say new technology has changed the transportation landscape in the last few years. Our region now has ride sharing, bike sharing, scooters, expanded transit lines and we engaged with firms interested in building an aerial tram and tunnels to Dodger Stadium. We have welcomed these new concepts and technologies because we can’t afford to be future-phobic. I have had the great honor to closely work with and advise Mayor Antonio Villaraigosa and Mayor Eric Garcetti on all transportation matters. Both made transportation a priority item on their agendas. Both clearly understand that L.A. can only thrive if it is willing to make major investments to help address chronic traffic congestion challenges. It was clear to both mayors that traditional infrastructure investments like widening and building new freeways only went so far and that we needed to finally offer good alternatives to driving alone. That is why we worked hard to pass two major Metro transportation ballot measures in 2008 and 2016 (Measure R and Measure M). Passing these measures was very challenging. This is because a two-thirds super majority popular vote is required to approve a sales-tax measure in California. Both mayors put everything on the line to help get the measures passed. It was a lot of work but we did it. This, of course, took an incredible amount of political capital early in their administrations. I am proud to be help lead these efforts and the fact that we were able to hammer out spending plans agreeable to the vast majority of the county. I think many generations to come will enjoy the benefits of having more mobility options — and I think the passage of both ballot measures sent a clear message to residents and businesses that our region was charting a new course. Is there ever going to be enough funding to do everything the region and state needs to do transportation-wise? Our mobility challenges in Los Angeles are massive — and ongoing investments will always be required. Mobility, as the New York Times said, really is the foundation of a city’s economy. The problem is that mobility has often been overlooked here over the years. How else do you explain allowing a massive streetcar system to be demolished instead of being modernized? Historically, both the state and federal governments have been natural funding partners on major transportation infrastructure projects. But things have changed. The tide has now shifted and cities and regional transportation governments such as Metro have to step up to find ways to fund transportation solutions. The good news is that locally we have stepped up. We believe state and federal investments in mobility must continue — since mobility is fundamental to so many things important to America — jobs, trade, freight movement, travel, pretty much everything. Measure M will invest a total of $120 billion in its first 40 years on subways, light rail lines, road and highway improvements and first-last mile connections. We’re getting the Purple Line to the Westside — the region’s second largest job center. Another rail line will travel across the Sepulveda Pass to the Westside. We’re finally tying three light rail lines together in downtown L.A. — something that will make all three rail lines more appealing. And we’re building a Metro Rail connection to LAX, something that has eluded our region for decades. We also worked to come up with new and innovative financing strategies to maximize and stretch our funding investments. Metro is now seriously exploring Public Private Partnership strategies that can optimize project costs and expedite the completion of projects. All this took a collaborative effort from past and present Metro Board members and a lot of work from Metro staff. We spent a lot of energy to build consensus. Finding solutions to address L.A.’s traffic problems requires you to work 24 hours 7 days a week. Since I starting working on Metro issues for Mayor Villaraigosa, I never missed one Metro Board meeting. That is how important it was for me. L.A. deserves it. What do you think the region will look like transportation-wise when the Olympics come to town in a decade? The 2028 Olympics provide an incredible opportunity to show the world that Los Angeles is a modern, world-class city with an advanced transportation system. A lot of what we need to get built by 2028 will get built. But we knew that the Olympics created a unique opportunity to motivate Metro, private industry and local partners to try to accelerate a number of key transportation projects. In late 2017, we launched the “Twenty-Eight by 2028” initiative that aims to accelerate a number of important Measure M projects in Los Angeles. This includes the construction of the Purple Line Extension, the Green Line Extension to Torrance, the West Santa Ana Branch between Artesia and downtown Los Angeles and a number of other key projects. Too many people tend to think of the traffic challenges in Los Angeles as insurmountable. They’re not. All sorts of things never supposed to happen in our region have happened. We routinely close down streets for CicLAvias and other open streets events. People crowd trains to go to football games, concerts, the beach and public marches. Our skyline has markedly changed, with many new buildings near many transit lines. Sure, having a car is nice — but many people are finding it’s pretty easy to get around without one. We have an opportunity to demonstrate to the world our region will have an advanced transportation system — and also deliver mobility benefits sooner for future generations. Sure, there’s a lot of work ahead. But I’m very grateful to work with so many people and two fine Mayors to help the region take its first big steps forward. Thank you Borja for helping bring Phil Washington to LA, for Measure M and for everything else you have done all of these years for transit and LA!